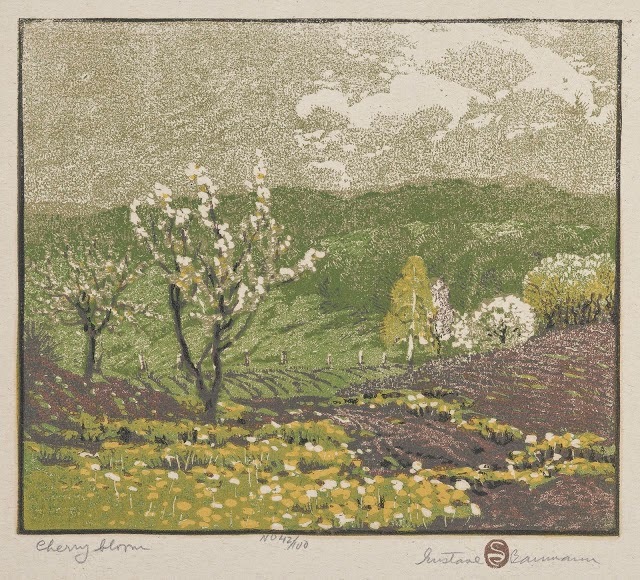 Aijung Kim: Unmotivation, Gustave Baumann Woodcuts, and the "Bloom" Giveaway Winner! Unmotivation, Gustave Baumann Woodcuts, and the "Bloom" Giveaway Winner! I must admit that I've been lazy for the last week or so. I hate the word lazy. Okay, I've been in a rut. But that's not exactly true. It's not artist block. I have ideas, I have some direction, I have materials ready. Unmotivated. That's the word. Whenever I feel lazy or unmotivated it's usually because I feel tired out (probably from travelling to Philly a week ago to do the Punk Rock Flea), or I'm in limbo because I need to decide on something but I'm afraid to or not ready to yet. Also, recently I spent a lot of my time cleaning and organizing my studio and finishing up older projects. I wanted my physical space and my head space to be clear and ready for new things. Now I'm ready but still feel unmotivated. Argh! I blame it on the heat. I have an art show coming up in November, and I've been trying to plan on what I want to create for it. I have two threads of ideas that I'm not sure will mix well in one show, so I tried to choose between them because I only have so much time to work. It was really hard for me to decide! For now, I'm going with the theme of landscapes and city scenes. I've taken lots of photos in the last few years and I want to translate those into linocut prints to reflect the beauty, spaciousness, and colors of the places I've seen. It feels a bit scary to me because most of what I've created in the past has been infused with more of my own imagination. I wonder if my landscapes will seem devoid of my artistic personality (ha ha, there's my ego creeping in!) I am also feeling a bit daunted by producing this body of work because I will be working with more colors which will take more time and planning. I have to find ways to simplify the images if I'm to finish enough work for my show! I want to get the right amount of detail but also capture the essence of the image. All of these are challenges, but I think that they will stretch my artistic muscles. 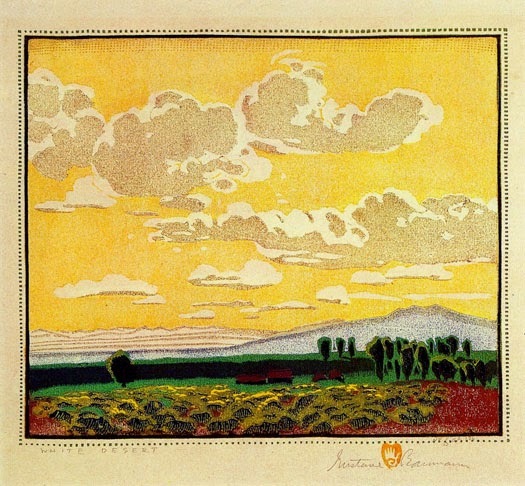 I'm taking a lot of inspiration from the woodcuts of Gustave Baumann, one of my favorite printmakers. When I look at his work, I am reminded that it doesn't matter whether the image came from my imagination or not - it just matters if it has life in it. An artist's job is choosing what and how to depict something in order to give it that special life. 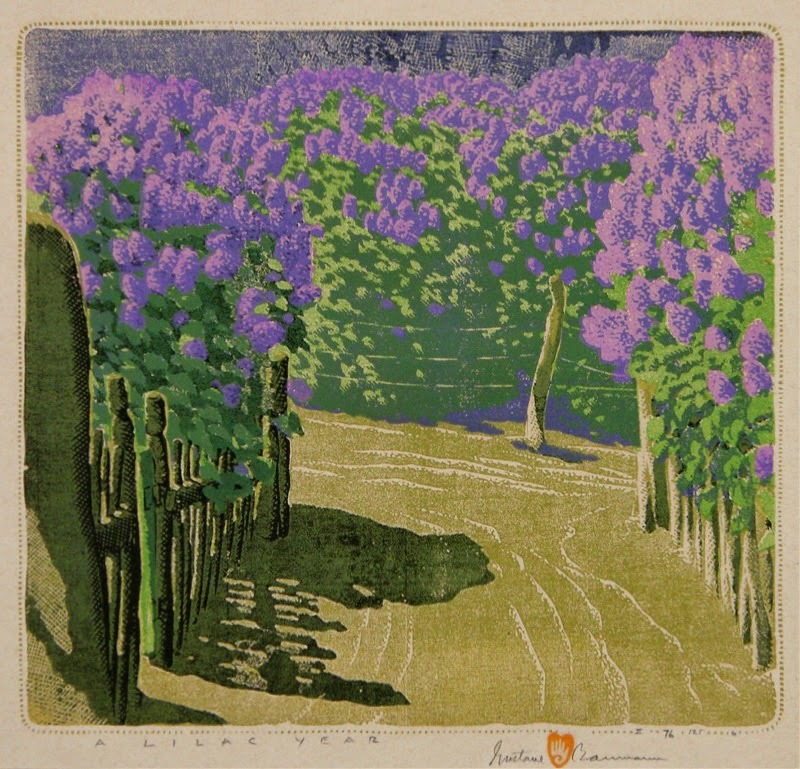 Baumann's work is very recognizable as his own, even though there are lots of landscape artists out there. I love the way he captures light, and his subtle overlays of color. I tried to count how many colors he uses, and it's usually at least 7 different colors. Whew! 7 colors in one linocut print is a lot for me. I'm going to try to simplify down to 4 or 5 if I can. But we'll see. His landscapes are so spacious. They make me feel calm, like I have infinite space to breathe within them. I also love his artist's seal - the open hand on a heart in the middle of his signature. So cute! Man, I need a seal. 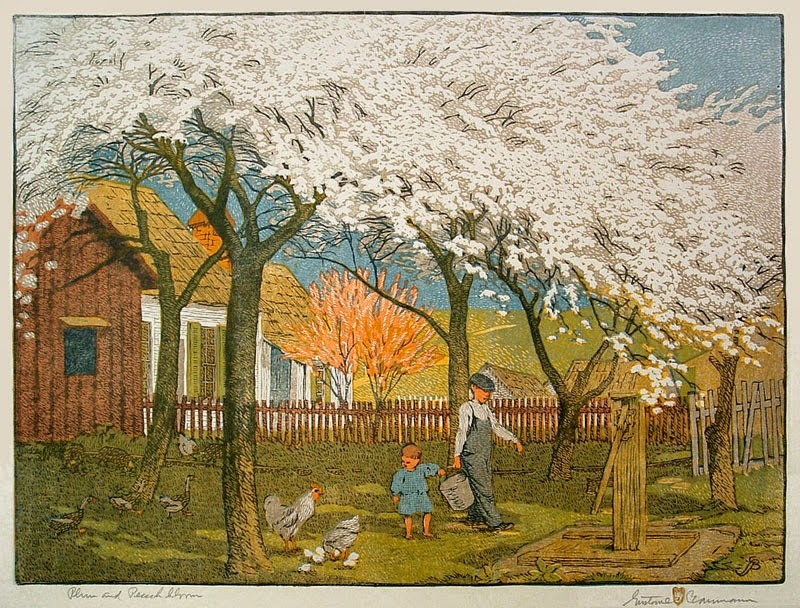 According to my Pomegranate book of Baumann postcards, Gustave Baumann (1881-1971) was born in Germany and immigrated to the United States when he was 10. When he was 16, his dad left and it was his responsibility to support his entire family! He began full-time work at a commercial engraving house and took night classes at the Art Institute of Chicago. If I think I have it hard sometimes, it's good to remember that some artists had it WAY harder. I'm also thinking of artist and illustrator Wanda Gag, who was put in a similar position when she was young. I'm just plain wimpy compared to them. Baumann later worked at an advertising studio, and also travelled to Munich to study at the School of Arts and Crafts. 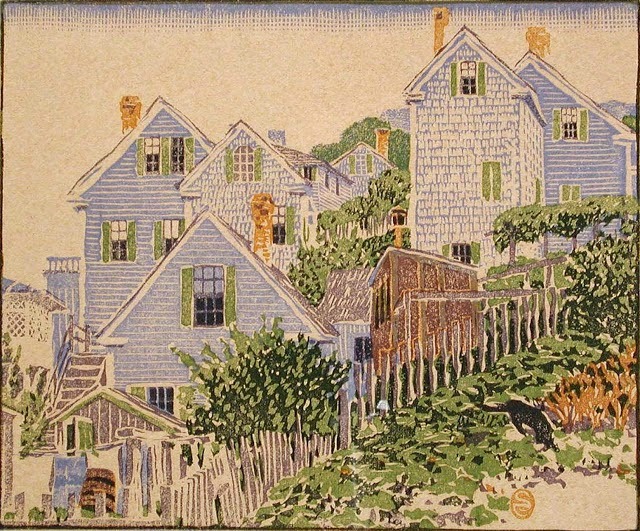 In his mid-thirties, he moved to multiple cities on the East coast and then finally settled in Santa Fe, New Mexico, where he lived for more than 50 years. I love that even though Baumann had a hard start, he really took his life into his own hands by making a living as an artist, attending school, travelling, and finding the place he could truly call home as an artist and person. And his work is AMAZING. 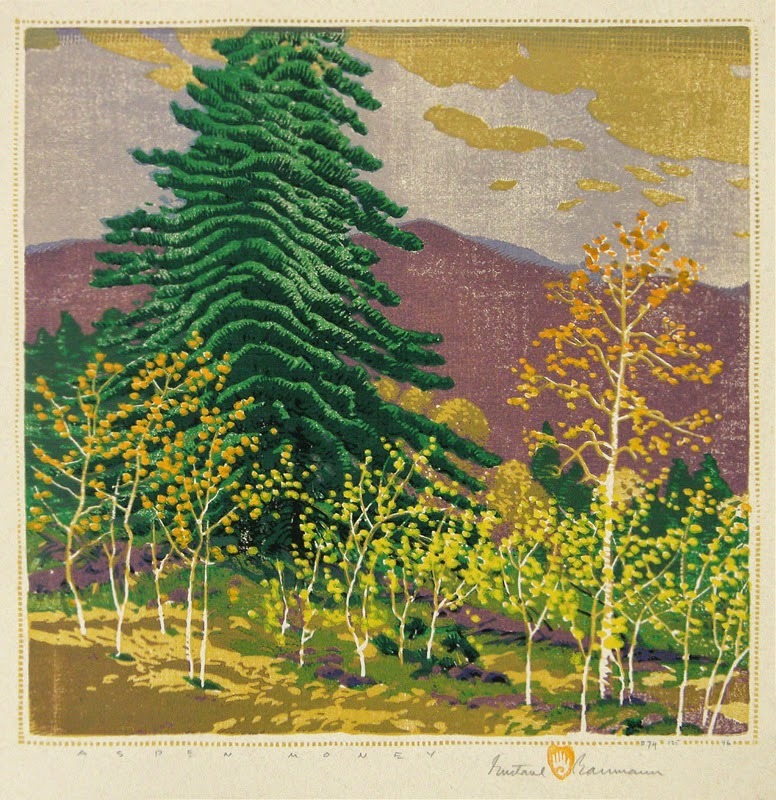 I can only strive for my landscapes to possess a bit of the magic that Baumann's did. It's time for me to get back to work! You've won my "Bloom" linocut print! Please get in touch with me and let me know which color scheme you prefer: good_old_fashioned_smell (at) hotmail (dot) com. Thanks everyone for leaving comments. I was inspired and encouraged by all of you, and will take your suggestions into consideration. I already have plans to print on tote bags, make more zines, and do some black and white linocuts! Actually, most of your suggestions were ideas I was considering anyway, but you all gave me a push. Thanks so much! eeeeeee! Thank you so much Aijung! :) And thanks for sharing, those landscapes are beautiful! I'd never heard of that artist before. You are so talented, I can't wait to see what you come up with for the show. I will email you right now. Thanks again!